Samadhan focuses of ensuring greater Accountability & Transparency of government & greater participation of people in decision making as a means of redressing social justice & positive social engineering to promote & upkeep the human rights of people. Samadhan places particular emphasis on democratic principles of accountability & peoples participation has developed strong focus on Peoples access to justice and access to information to upkeep & nourish values of inclusive democracy. Emergency Medical Help, Food & Shelter Support, Natural Disaster Support , Support of Victims of Domestic Violence, Women & Child Welfare Support, Women Empowerment Support, Women in Distress Support. 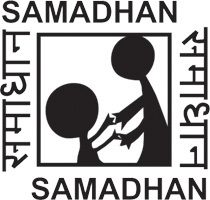 SAMADHAN is an NGO registered under the Societies Registration Act and began functioning in 1983. Two centers have been established.The first one is in a resettlement colony in South Delhi, called Dakshinpuri, a low socio economic community and the second in Dwarka a middle and upper middle class residential high rise apartment area. We are winners of two international awards form the World Bank and from The Inclusion International respectively.